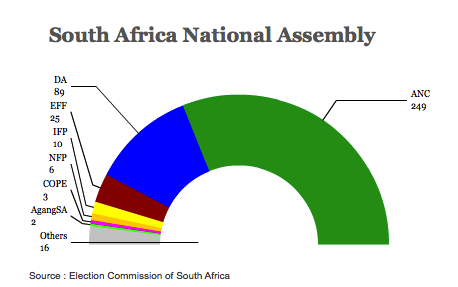 For the record, I’ve updated the final charts from this week’s earlier South African national elections — you can read more analysis of what the results mean here, and you can read more coverage leading up to the vote here. 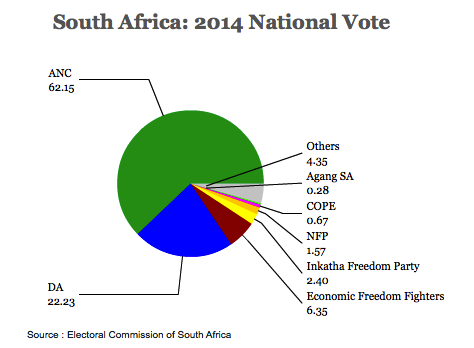 The final result for the ruling African National Congress (ANC) was 62.15%, That’s slightly less than in 2009, when it won 65.90% of the vote and in 2004, when it won 69.69% of the vote, but it’s close to the 62.65% that it won in the initial 1994 post-apartheid election. It’s generally an impressive victory, and though it falls short of the two-thirds margin that president Jacob Zuma may have hoped for, the ANC didn’t come close to falling below the 60% mark, as some of its officials once feared. The Democratic Alliance (DA) posted its best-ever election result, gained 5.57% on its 2009 showing. But it’s still far, far behind the ANC, and it has quite a long path if it wants to become a truly credible alternative to the ANC.